On Saturday, September 12 2015, you can join thousands of people around the world in measuring how bright the night sky is where you live. The results from this experiment will help scientists to understand how the night sky is changing over time, as cities switch to LED street lighting. All you need is a place that’s not too close to any street lamps where you have a view of a good portion of the night sky, and clear skies on that night. In Globe at Night, citizen scientists compare the visibility of the stars in constellations like Orion to a set of star charts (see above). You can either print the charts out in advance and report online later, or use their web app on your smartphone. Globe at Night information is available in 26 languages. The loss of the Night app directs you to specific stars in the sky, and asks whether you can see them with your own eyes or not. The faintest star that you are able to see tells us how bright the sky is. The app runs in 15 languages, and detailed instructions on how to use the app in iOS orAndroid are available on the project blog. The Dark Sky Meter app uses the iPhone’s camera to directly measure how bright the night sky is. You first take a dark image with the phone in your pocket to calibrate the camera, then point the phone straight up into the sky and take a second photo. The app is available in a lite and full version. Click for more information and maps of observations. The reason for the International Nights of Skyglow Observation is to synchronize as much data at the same time of year as possible. You can actually take part in all three of these experiments all year long (any time that the moon is not up). Try observing again as the year goes on, and find out what time of year is best to go stargazing where you live! Random people without any specialized training looking up at the sky… is this really science? It is, and it has a special name: Citizen Science! Truth be told, each individual observation from these campaigns is not particularly reliable on its own. But by averaging the results of thousands of observers, very precise measurements of the rate of change of skyglow are possible. Artificial light allows us to extend our activity into the night both indoors and outdoors, but it unfortunately comes with some negative side effects, such as less sleep. Light that shines outdoors produces skyglow, as seen in the photos below. The image on the right shows the Milky Way inside of the Westhavelland International Dark-Sky Reserve. Above the park, thousands of stars shine brightly against a dark background. At the horizon, however, lights from cities like Berlin spoil the view. The photo on the left was taken with the same camera, lens, and settings in a backyard garden on the outskirts of Osnabrück, Germany. Far fewer stars are visible because of the artificial glow of the sky. 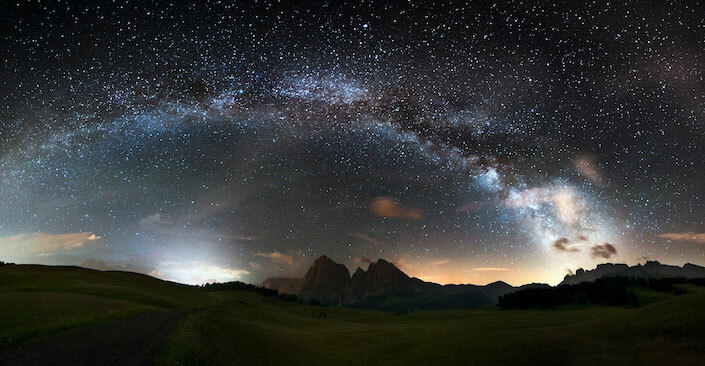 As one moves closer to a city, the Milky Way disappears, and eventually only the very brightest stars, planets, and the moon can be seen at night. Solid state lighting like LEDs is going to change how the sky glows, but for the moment, we don’t know whether it’s going to get brighter or darker. There are reasons to be optimistic: solid state lighting can be more easily directed, allowing cities to shine light where it is needed. Ideally, poorly designed lamps shining directly into bedroom windows and up into the sky should be a thing of the past. However, LED lighting often has a large blue component. Blue light is more likely to be scattered by the atmosphere, so it could make the sky brighter. The only way we can find out what’s going on globally is with the help of people like you! By repeating the same measurement in future years, together we will be able to measure the rate at which the sky is getting brighter or darker. Christopher Kyba is an IDA board member and studies the ecological impact of artificial light in the nighttime environment at the German Research Center for Geoscience in Potsdam. His work mainly focuses on quantifying the flux of light emitted upward by cities (using aerial or satellite observations), and the light that is returned back to Earth as skyglow. One of his current research interests is in examining observations made by citizen scientists in order to understand how skyglow is changing with the introduction of LED lamps. This post originally appeared on the International Year of Light blog.